Located along the Atlantic Intracoastal Waterway, the Landfall gated community in Wilmington, North Carolina includes more than 1,500 homes just minutes from Wrightsville Beach. The Mews condo neighborhood is part of that premier planned development situated on 2,200 acres of land, including 320 wooded acres of conservation area with walking trails. To retain the uniformed appeal and design of Landfall, an architectural review board and individual homeowner associations are involved in decisions on both new construction and remodeling efforts — including roofing choices. For many builders and roofers the selection of roofing products at Landfall is easy — Valoré Slate roof from DaVinci Roofscapes. "Valoré polymer slate roofing tiles have been approved for widespread use throughout Landfall," according to Peter Foley, co-owner of Flores and Foley Roofing. "First the architectural review board had to approve the product and then the individual homeowner associations within the gated community reviewed and approved the composite slate roofing. Getting approval on this faux slate roofing material means it can easily be specified and installed for re-roofing and new home construction projects." Flores & Foley Roofing recently worked with Mark Johnson Custom Homes to add a Verde color blend roof of light and dark green Valoré polymer tiles to a new home constructed in The Mews. High-end contractor, Flores & Foley was started in 1999, and serves the Wilmington area in the residential and commercial roofing industry. "We enjoy installing DaVinci products," says Foley. "It's ideal for our coastal area location and offers a first-class appearance on the projects we complete." 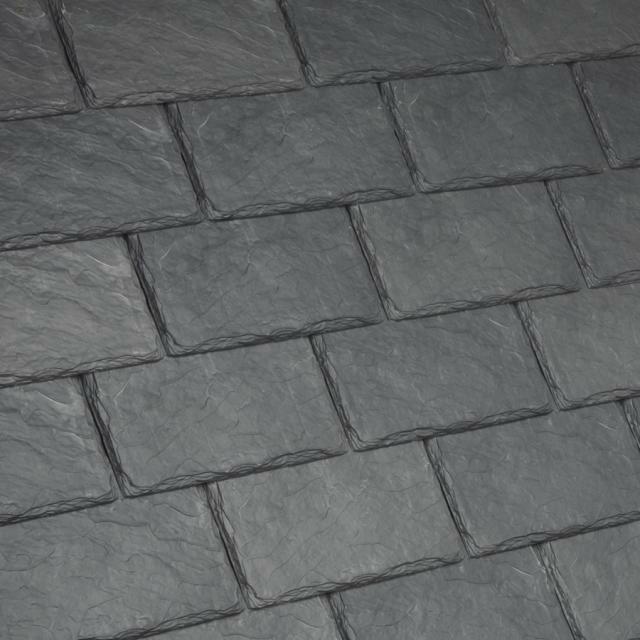 Valoré simulated slate roofing tiles come in a single 12" tile width and are impact-and fire-resistant. With a 1/2" thickness, the imitation slate tiles are twice the thickness of most other synthetic slates. The consistent single width provides the beauty of a clean, simple design for homes at Landfall and across America. For another example of Valoré Slate tile success see Valoré Slate Builds Business for Virginia Roofing Company.